This new development offers a range of 2 and 3 bedroom apartments and penthouses. 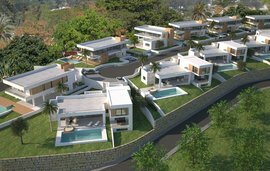 The development is set amongst the beautiful natural scenery in the hills about 10 minutes from Marbella, the beach and the most popular golf courses on the coast. 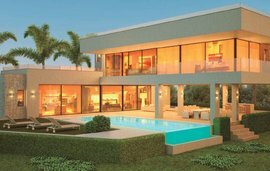 Not only does this development offer tranquility, space and a beautiful countryside that you can explore but it is also within close proximity to Marbella and all amenities. The development has stylish architecture and there are a total of 40 attractively designed properties which are divided into spacious garden apartments and duplex penthouses. All of the properties are well proportioned and ensure privacy. All of the apartments have marble floors, fireplaces, modern kitchens with Siemens appliances and luxurious bathrooms with walk in showers and heated floors. They have spacious living areas and large terraces offering spectacular panoramic views. This development is unique as it has its own Estate Manager dedicated to the running of the development. The materials that have been used are first class and the development has lush landscaping and a luxury resort inspired pool area with heated pol, lounge and bar area, unique hanging herb gardens and Zen Yoga platform.